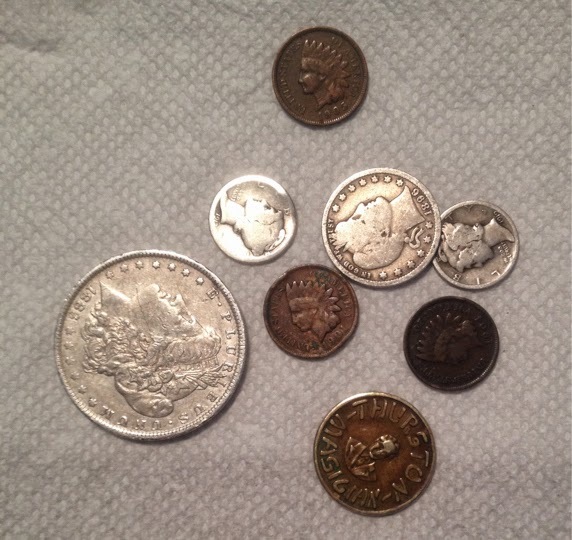 I have a few more coins to add, but take a look at the Indian Heads. They are low grade, scratches or minor rim dings. Perfectly fine for my pocket and I bought a lot of four for $8 including shipping. In one sense that's ridiculous as I could buy a roll of IHC's for $50 or less, but I don't need or want fifty of them; I just want a few for my pocket, so I was fine with that. Aside from that very minor scrape, this coin is a solid XF/AU. Some Young Numismatist of limited means would be very happy to have that. Maybe that's what I'll do with it - I wonder if PCGS would give it a net XF grade?